HTC U11 smartphone comes with Edge Sense and fingerprint sensor. The device is powered by a 2.45GHz Octa-core processor with 6GB of RAM. The device runs on the Android 8.0 Oreo Operating System and 5.5-inch QHD, Super LCD5 capacitive (1440 x 2560 pixels) touchscreen display. The Dual SIM device offers 128GB internal storage, expandable up to 2TB using microSD card. On the connectivity front, it offers 4G LTE, 3G, NFC, Bluetooth v4.2, USB Type-C, Wi-Fi 802.11 a/b/g/n/ac options. 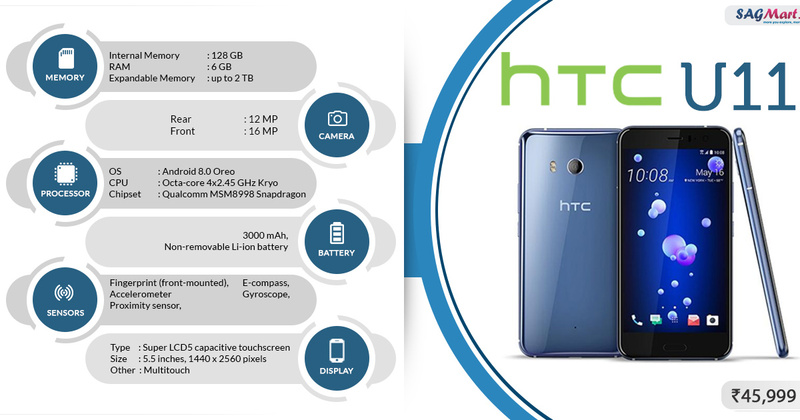 It packs 3000mAh Non-removable Li-ion Battery and sports a 12-megapixel rear camera along with 16-megapixel selfie shutter.